conorbebe and nzcamel like this. LoganInCamo, conorbebe, Kjimmet and 4 others like this. 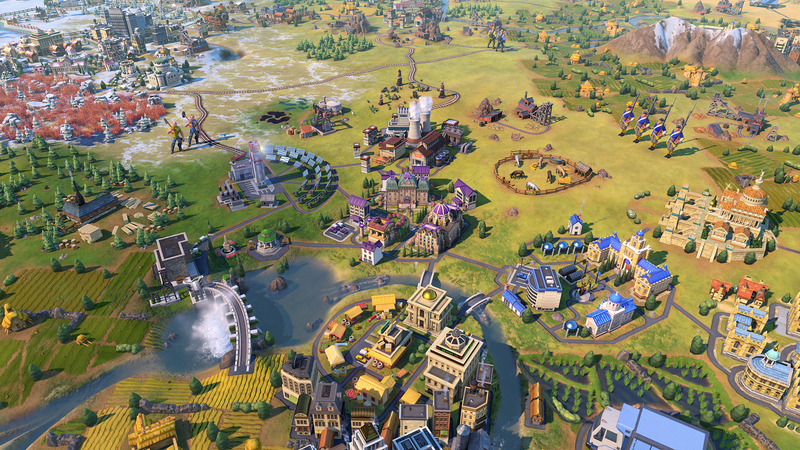 Sweden shines as a beacon of culture in Civilization VI: Gathering Storm. 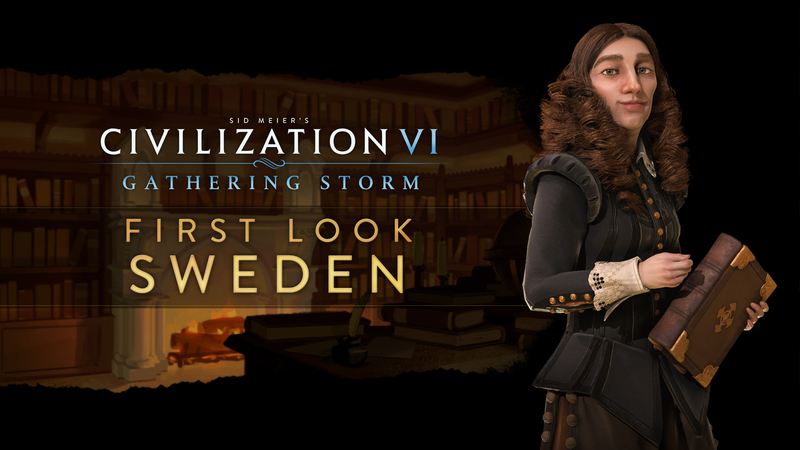 Led by Kristina, one of the most educated women of the 17th century, Sweden is one of the best civs to pursue a Culture or Diplomatic victory. 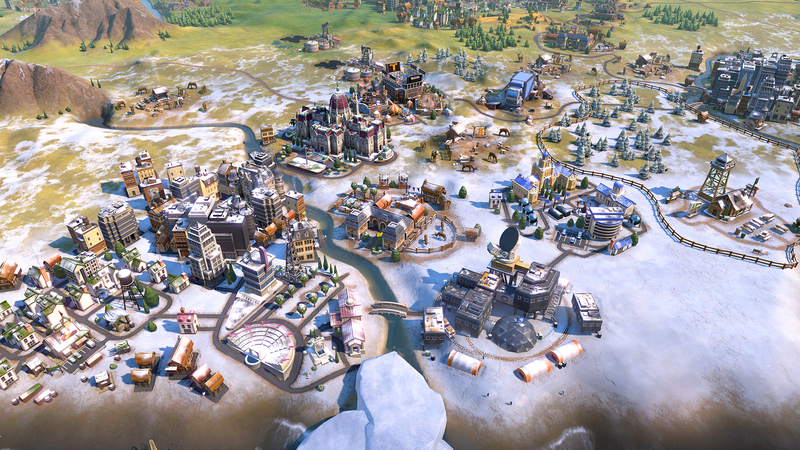 Fill up those Great Work slots, settle cities on as many varied terrain types as possible, and build Open Air Museums in every city and Sweden will be well on its way to outpacing its competitors. Limit one per city. Increases Loyalty, and boosts Culture and Tourism for each type of terrain in which at least one Swedish city has been founded. Constructed as a second tier building within the Government Plaza, where it provides two Great Works slots of Writing, Music, and any type of Art. Awards a Governor Title once completed. 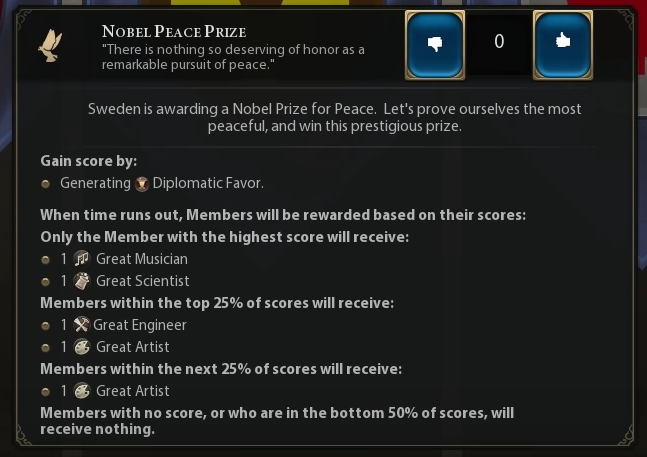 When earning a Great Person, Sweden receives additional Diplomatic Favor. Sweden gets extra Great Engineer points from Factories and extra Great Scientist points from Universities. 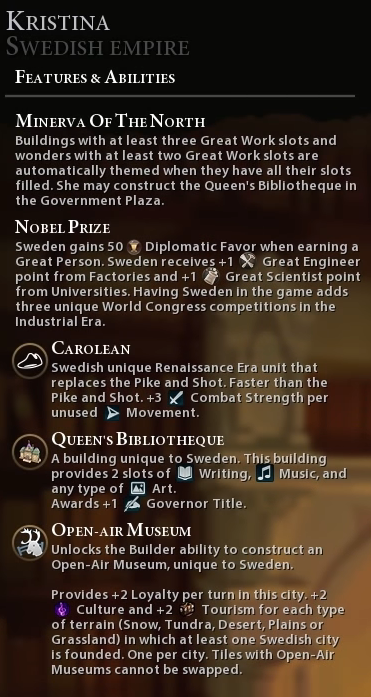 Unlocks three unique World Congress competitions in the Industrial Era if Sweden is in the game. Anti-cavalry unit unlocked in the Renaissance era. Replaces the Pike and Shot, has faster movement, and receives additional Combat Strength for each unused Movement point. 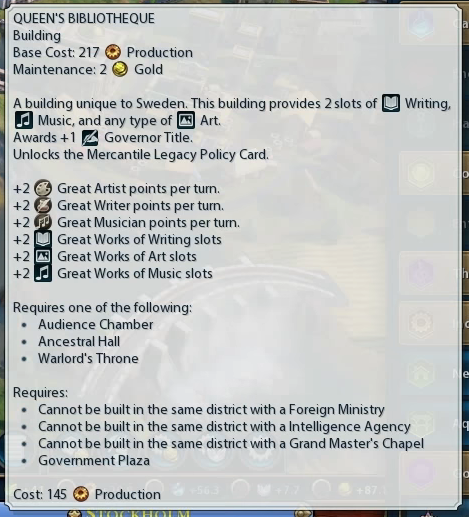 Allows Kristina to construct the Queen’s Bibliotheque building in the Government Plaza, and buildings with at least three Great Work slots and Wonders with at least two Great Work slots are automatically themed when all of their slots are filled. Inawordyes, conorbebe, Jewelrunna and 8 others like this. DeutschDachs, Slayan, Inawordyes and 16 others like this. what? Another Unique Improvement? Miscount again? Inawordyes, conorbebe, 679x and 4 others like this. altayrneto, Inawordyes, WorldWarIV and 10 others like this. awesome, Noble Zarkon, racha and 14 others like this. Tiger Genocide, Inawordyes, Depravo and 14 others like this. Tiger Genocide, Inawordyes, conorbebe and 5 others like this. Inawordyes, WorldWarIV, Jewelrunna and 6 others like this. Haig, Kjimmet, Guandao and 3 others like this. You changed your profile picture pretty quickly! George Abitbol, Inawordyes, conorbebe and 5 others like this. Inawordyes, conorbebe, Kjimmet and 7 others like this. Yes, she’s really well done. Her expressions alone. LoganInCamo, Inawordyes, WorldWarIV and 8 others like this. Inawordyes, conorbebe, Kjimmet and 5 others like this. They severely miscounted the new unique improvements, didn't they? Cooleatack, Inawordyes, conorbebe and 8 others like this. Seems to be quite strong, although you'll miss out on the other 2nd tier government plaza buildings. The improvement is quite good, as it seems. Also: themed wonders? This is new, right? George Abitbol, Myomoto and TahamiTsunami like this. Tiger Genocide, LoganInCamo, Imaus and 13 others like this. So the bonus was similar to British Museum but much better. This is cool! 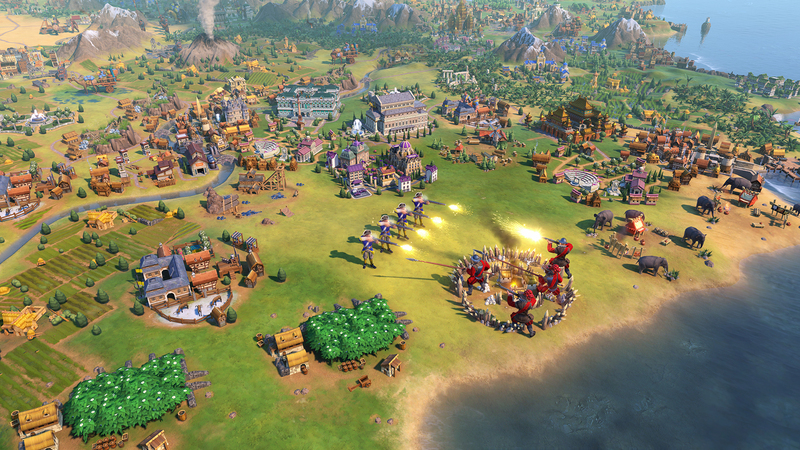 Cultural and Diplomatic civ, when we thought this will be strong on science! Bonus on GS and GE is okay too. conorbebe, Kjimmet, Jewelrunna and 5 others like this.